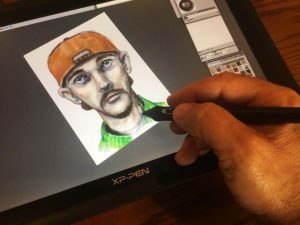 SketchCop® Solutions offers traditional composite sketch services & software-driven facial composite solutions for law enforcement, intelligence, military, corporate and private investigators. Private commissions will be considered on a case-by-case basis and ONLY in cooperation with law enforcement. Composite sketches are the most familiar and widely-used form of forensic art. SketchCop® Solutions has provided composite sketch services to nationwide law enforcement agencies for nearly four decades. To view examples of our success, please visit our Captured Gallery. To choose the best option for you or your law enforcement agency, please review the information listed below. Law enforcement agencies, government, military, corporate and private investigators are now able to create their own composite sketches. 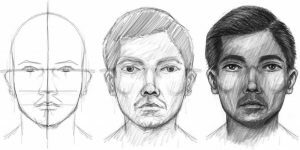 Frontalis® Facial Composite System software allows users to create sketch-like images similar to those created by police sketch artists. Training and support is available. To see examples of our client’s successes, visit our Success Stories page. If your case is time-sensitive, or beyond our service area, you can schedule an online composite sketch interview. It’s an easy & flexible solution for most law enforcement agencies. SketchCop® Solutions is an industry-leader in producing online composite sketches. We’ve successfully conducted over 100 online interviews for law enforcement agencies throughout the United States. SketchCop® Solutions currently provides remote/online composite sketch services to the Baltimore City Police Department. SketchCop® Solutions responds to locations within a 60-mile radius of our main office in Corona, CA. Locations beyond our response area will be invoiced for travel time and mileage. Law enforcement agencies who contract with SketchCop® Solutions are exempt from additional charges. To request a facial composite software demo, or a composite sketch appointment, onsite or online, please complete the request form on the right side of the screen. Or, visit our Contact page.